President Lobo congratulates the U-17 “La Selección” national soccer team of Honduras for qualifying for the World Cup quarter finals. President Pepe Lobo on Monday celebrated the success achieved by the Under-17 Selección of Honduras (Honduras U-17) national soccer team against their rival Uzbekistan, by the final score of 1-0. This achievement classified the Honduras U-17 to participate in the quarter-finals of the FIFA 2013 World Cup, being held in the United Arab Emirates (UAE). 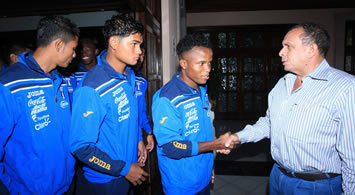 The Honduras U-17 begins the final countdown this Friday, November 1, 2013. Honduras will be playing “futbol” against Sweden, and if they manage to qualify for the second round of the World Cup quarter-finals, would be part of a historic event, as the U-17 national football team has never before been able to achieve that goal. Go Selección! Go Bi-Color! Go Catrachos!